This book is the story of the life of Pamela Lattimer after her marriage when she left England to live in Fiji. She had to return to England during the war which seemed bleak and unwelcoming after the Fijian islands, but she resumed her journeys when it ended and returned to the Far East with her children to Singapore where she stayed for a few months, then on the Penang, two places which held great affection for her. She gives a delightful account of life abroad with a small family and the problems one had to face as a wife and mother. Her years in Kenya where her fourth child was born and the difficulties in that country in 1952 with the unrest caused by the Mau Mau, are all noted with a keen observance. The story ends in Malaya in Kuala Lumpur where the Lattimers finished their overseas tour and once again they set sail for England and to begin another life. 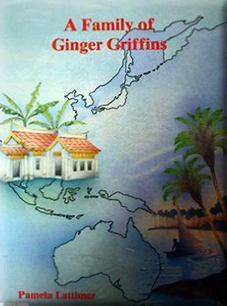 The title of the book is taken from the name "Ginger Griffin", dubbed to all new comers who arrive in Singapore - no doubt familiar to many readers.